Gregory Zinovyevich Kaidanov (Russian: Григорий Зиновьевич Кайда́нов; born 11 October 1959) is an American-Ukrainian chess grandmaster. 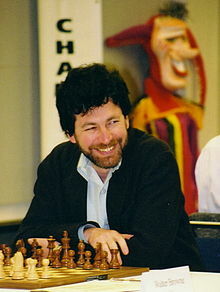 As of April 2007, his Elo rating was 2587, making him the No. 9 player in the US and the 179th-highest rated player in the world. His peak rating was 2646 in 2002. He was inducted into the United States Chess Hall of Fame in 2013. Kaidanov was born in Berdychiv, Ukrainian SSR, USSR. In 1960 he moved to Kaliningrad, Russian SFSR, USSR. He learned chess from his father at 6 years of age, and at age 8 began attending a chess study group in "Pioneer's House". He defeated future World Champion Viswanathan Anand in Moscow in 1987. The same year he earned the IM title, and the following year the GM title. He won the US Open and World Open tournaments in 1992. Kaidanov is the head coach of the United States Chess School and teaches at the grandmaster level. In 2009 he was awarded the title of FIDE Senior Trainer. Kaidanov has resided in Lexington, Kentucky since 1991, where he coaches the chess team at Sayre School. He is married to Valeria Kaidanov, and together they have three children: Anastasia (born 1983), Boris (born 1986) and Sonya (born 1994).